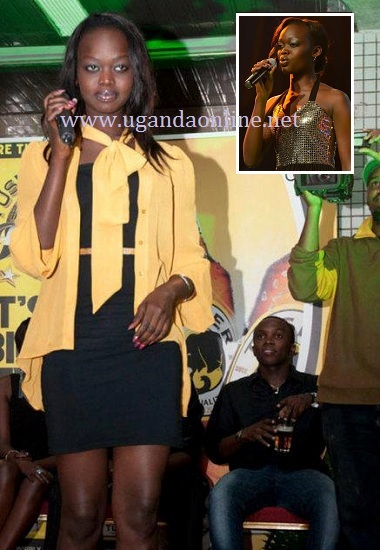 Uganda's Sharon Nalwoga is still in the run for the top prize of Tusker Project Fame five after surviving the the chopping block that saw Nancy from South Sudan evicted. At the start of the show Seven contestants were left with 4 on probation and at the end of the performance, six contestants were left. Tonight's show was about creativity. Joe kicked off the Saturday show with a reggae version of 'Shauri Yako' Judge Hermes loved his performance and Judge Ian said it was a very very much improved song and was able to breath. Judge Juliana loved his performance vocally. Steve was next doing 'Its not Unusual' and Judge Ian was impressed with his performance. Uganda's Sharon bounced back with her Sweetest Taboo that got her on the line the previous week. She had dancers to back her up in her short blue dress. Judge Hermes told her that if she had done that last week, she could not be on probation, Judge Juliana said she was great though she over danced. Judge Ian said it was 'Bulungi' meaning a good performance. Nancy from South Sudan was the last one to perform doing a song from South African Diva Yvone Chaka Chaka Mr. DJ. Judge Ian told her that she looks better than she performed. Nancy said Thank you. Judge Juliana also said that she enjoyed her performance more than last week. Judge Hermes did not enjoy her show. At the end of their performance which was live on NTV in Uganda, the results for the Public vote were delivered and Joe was saved by the public. Contestant Jackson saved Sharon but it was not enough so it crossed to the faculty to chose from Nancy and Sharon. They chose someone who has talent and so they saved Uganda's Sharon. Its not the end of the road, its the beginning of the highway were the words by Nancy as her last remarks as she left the Academy. Tomorrow is Nomination night.